Earlier today, Hockey East did what opposing goalies have been unable to do this season—rob Matt Nieto. Somehow, the Terrier sophomore wing didn’t get the nod for player of the week. No knock on the two players who did share player-of-the-week honor, but it’s awfully easy to make a strong case for Nieto who turned around Friday’s game with his fifth goal (video) after a UMass breakaway was stifled and also assisted on the tying goal. During Saturday’s rematch, he set up a pair of goals, including Charley Coyle’s shorthander to knot the score, then wristed home the overtime game-winner (video), extending his consecutive game streak to eight games. Oh yes, he earned first-star honors in both games—making it three times in six games—which leaves him tied for the top spot in the conference’s Army ROTC Three Stars Award standings. 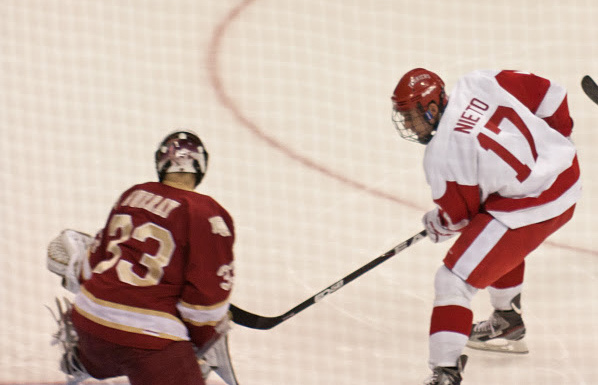 Nieto did make the conference list of top performers for the week along with Coyle and Sahir Gill, who scored a goal in both UMass games and has at least one point in every game this season. Terriers moved up a notch to 12th in the USCHO poll and remained at 12th in the USA Today Poll. BU now leads the nation in shorthanded goals with four, while Coyle leads all conference skaters with a +9. Former Terrier Nick Bonino, who is fourth in the AHL in assists with nine, has been recalled by the Anaheim Ducks from Syracuse. It took the continuation of one streak to end another one. Matt Nieto rifled a shot home in overtime—his sixth consecutive game with a goal this season—to end the Terriers’ two-game non-winning streak as BU edged UMass, 5-4. The red-hot left winger added two assists and, with his goal and assist on Friday, completed a five-point weekend. The Minutemen had sprinted to 3-0 lead, scoring late in the first on a bad bounce clearing pass by Ryan Ruikka and a goalmouth turnover by Charley Coyle. But after killing a UMass two-man advantage in the second period, BU began chipping away. First Garrett Noonan roofed a pass from Corey Trivino, then Sahir Gill pounced on a rebound to score his second goal in two nights . Terriers continued to press in the third period and knotted the score on the first goal of the year for Coyle, a shorthander assisted by Nieto. Trivino’s fourth gave BU its first lead midway through the third period, but UMass responded with a Mike Pereira power play goal, squaring things at 4-4. In overtime, a UMass crosscheck on Cason Hohmann put BU on the power play, setting the stage for Nieto’s heroics. Senior Grant Rollheiser, who stopped 29 shots in his first action of the season, was solid over the final two periods after a shaky start. Freshman Evan Rodrigues, who was rewarded for strong play by being moved BU’s first line, registered his first two career assists on the Noonan and Trivino goals and earned kudos from Coach Jack Parker. Nieto, who now has an eight-game goal scoring streak going back to last season, and was cut from the U.S. Junior National Team roster during evaluation camp this past summer. His standout play at both ends of the ice is likely to win him reconsideration for that squad . Nieto earned first-star honors for the third time this season, while Trivino, who was dominant on faceoffs, winning 17 of 23, was the game’s third star. An 8/16/92 birthdate and Victoria, BC native, Myron, who had a 20-21-41 line for the Grizzlies last season, was named to the Canada West selection camp (Oct. 29- Nov. 1) for the upcoming World Junior A Challenge, beginning Nov. 7 in Langley, B.C. St. Cloud and Michigan also were interested in him, too. ►With Myron at Canada West camp, Moran was back on the Grizzlies' top line, scoring the game-winning goal and adding an assist in a 5-2 Victoria win against Coquitlam. For the second time in eight days, he earned first-star honors. Since being traded to the Grizzlies, Moran has 11 goals, including three game-winners, and 19 points in 13 games. The Terrier absorbed their second straight defeat at the hands of top-ranked Wisconsin, losing 6-1 in Madison. Taylor Holze’s second goal of the season, knotted the score at one after the opening period, but the Badgers, who had 40 shots, added a goal in the second period and four more in the final stanza. Terriers and Minutemen do it again tonight, this time at Agganis Arena. 7 p.m. start. Terriers traveled West yesterday to Amherst and rallied for a 2-2 overtime tie with UMass. Sahir Gill's third-period goal, his second in two games, knotted the score, after BU had fallen behind 2-0. After an Alex Chiasson shot hit the post, the Minutemen scored a power play goal with 34 seconds left in the opening period, then doubled their lead in the second with a goal just seconds after another power play expired. BU spent nearly a third of the middle period killing penalties. After Chiasson clanged another post, the Terriers finally got on the board when, with the teams skating 4-on-4, sophomore Matt Nieto scored his fifth goal late in the period on a feed from Charley Coyle. Senior goalie Kieran Millan, who was named second star, turned away 33 shots. Former Terrier captain Sean Sullivan scored the game-winner for the Worcester Sharks in a 4-3 overtime victory over Bridgeport. John McCarthy added an assist for the Sharks. Chris Bourque notched his sixth goal of the season for Hershey in a 4-3 loss to Springfield. Terriers were defeated, 3-0, by Wisconsin in the first of two games with the defending national champion Badgers. Goalie Kerrin Sperry stopped 37 shots, including 17 in the opening period, to keep BU in the game. Terriers look to rebound with a pair of conference games against the UMass Minutemen, beginning with tonight’s game in Amherst. New defense pairings, including sophomore Adam Clendening with classmate Garrett Noonan (photo), and junior Ryan Ruikka’s return are expected. And senior goalie Grant Rollheiser should see his first action of the season in one of the games. The 7 p.m. start will air on NESN. The Bleacher Report took a crack at choosing the 10 greatest college hockey goals of all time. Nick Bonino’s game-tying goal in the 2009 NCAA final ranked third, while Mike Prendergast’s game-winner in 1993 that snapped Maine’s 32-game winning streak earned honorable mention. #1? Michigan’s Mike Legg’s “lacrosse goal” against Minnesota in the 1996 NCAA regioinal. Help for the D on the way? As the Terriers approach a weekend pair of conference games—home and home with UMass—Coach Jack Parker indicated that junior defenseman Ryan Ruikka (photo) may rejoin the BU lineup after missing the first four games with a broken foot. On Inside Terrier Hockey he also told Bernie Corbett that reshirt freshman forward Yasin Cisse (concussion) is not yet ready for game action. This week’s edition of Inside Terrier Hockey also has Corbett interviewing two former Terriers—L.A. Kings Director of Pro Scouting Steve Greeley and Friends of BU Hockey Chairman Paul Giandomenico, a sparkplug forward on BU’s 1971 and 1972 national champions. ● More in the injured Terriers from The Daily Free Press. This is alumni weekend at BU and among the recipients of the Distinguished Alumni Awards will be former Terrier Travis Roy, a motivational speaker and activist who established the Travis Roy Foundation after suffering a paralyzing injury playing in his first hockey game as a BU freshman. Roy will receive the Young Alumni Award. Kevin Shattenkirk assisted on two Blues’ goals in a 3-0 win against Vancouver. Syracuse Crunch forward Nick Bonino, scoring a goal and an assist, helped make it a miserable night for an ex-teammate, Zach Cohen, and former coach, David Quinn, as Syracuse crushed Lake Erie, 7-0. 2013 recruits Brendan Collier (Malden Catholic) and Sam Kurker (St. John’s Prep) have been named to the Mass High School All-Star Team that is headed to the 2011 Bauer National Invitational Tournament in New Hope, Minn. Nov. 4-6. Collier, Kurker, Dan O’Regan, and Kevin Duane all received B ratings in NHL Central Scouting’s latest listing of players to watch for the 2012 draft. 2013 recruit Rob Baillargeon also received a B rating in an earlier listing. Mike Moran - Has nine points in his last two games showing how dominant and how key to the Grizzlies he is this season. Hard to knock of the puck, sees the ice well and can be a real difference maker. The Terriers travel to Madison, Wisconsin, this weekend to take on defending national champion, Wisconsin for a pair. The Badgers beat BU, 4-1, in last year’s NCAA title game. Senior defenseman Tara Watchorn, recovered from a concussion, will return to the BU lineup, but injured senior forward Jennelle Kohanchuk is not expected to be available. Wisconsin Coach Mark Johnson, an Olympic teammate of O’Callahan, discussed the weekend matchup. In the weekly rankings, the 2-2-0 Terriers fell to 13th in the USCHO poll and 12th in the USA Today poll. Monday was a sad day for the college hockey community as Alabama-Huntsville, an independent since the demise of the College Hockey American conference, decided to shut down its Division 1 program, replacing it with a club team. ●Analysis from Chris Dilks of the Western College Hockey Blog. An AHL.com feature talks with Providence Bruins’ rookie David Warsofsky. After scoring two goals and five assists in a pair of wins for the GB Bruins U18s, 2013 recruit Brendan Collier continues to lead the Mass Midget Selects league in scoring with a 9-13-22 line. Captain Jenn Wakefield, freshman Kayla Tutino and goal Kerrin Sperry—who has four 30+ save games this season—all made Hockey East’s top performers’ list for their efforts in the weekend’s win and tie in the North Country. ● Terriers dropped to #5 in the USCHO weekly rankings. Facing Holy Cross last night, the Terriers emulated their effort from last weekend. Unfortunately, it was a flashback to the loss to Providence, rather than the victory over Denver. Defensive mistakes, untimely penalties and penalty-killing failures, lack of either a forecheck or crisp breakout—and a strong effort by the Crusaders—gave the visitors a well-earned 5-4 upset win. After an early Holy Cross goal, BU responded with a pair of well-executed passing plays, resulting in Sahir Gill’s first goal of the year and Alex Chiasson’s third. But the next 40 minutes belonged to the Crusders, who scored four times, twice on power plays. BU had previously yield just one power play goal this season. they were good at all of that stuff." For the third time this season, 2012 recruit Mike Moran earned first-star honors in BCHL play. His hattrick--plus an assist--led Victoria past Chilliwack, 7-5. Moran has a 9-5-14 line in 12 games. Terriers completed their North Country weekend, edging St. Lawrence, 3-2, behind Kerrin Sperry's 36-save performance and the eventual game-winner by captain Jenn Wakefield. BU moved out to a 3-0 lead on goals by Kayla Tutino, Shannon Mahoney and Wakefield before yielding a pair of goals to the Saints. Sperry made 14 saves in the final period to seal the win. Terriers face off tonight against Holy Cross at Agganis Arena in their final non-conference game until Red Hot Hockey vs. Cornell after Thanksgiving. 2013 recruit Robbie Baillargeon assisted on three goals in Indiana’s 6-2 win against Tri-City. 2012 recruit Robert Polesello also added a helper. Nick Bonino recorded his second 3-point game in a week, assisting on three goals, including the overtime game-winner, as the Syracuse Crunch beat Lake Erie 4-3. Dave Van der Gulik had an assist for the David Quinn-coached Monsters. Scott King, who played BU’s 1995-96 Frozen Four squad, continues his long professional career in Europe and currently is the leading scorer for the Hannover Scorpions in the German DEL. Other ex-Terriers in the DEL include John Curry with the Hamburg Freezers and John LaLiberte with Wolfsburg Grizzly Adams. Freshman Kayla Tutino’s unassisted goal late in the final period—her fifth of the season—enabled the Terriers to tie Clarkson University, 2-2, at Cheel Arena in Potsdam, N.Y. BU took an early lead on junior Taylor Holze’s goal, but the Knights pulled even on a two-man advantage in the second and took the lead early in the third. Kerrin Sperry stopped 32 shots for BU, which takes on St. Lawrence today in nearby Canton, N.Y. (which is home to men’s team forward Wade Megan). On Saturday, BU takes on another non-conference opponent, Holy Cross, at Agganis Arena. The Daily Free Press talked with junior assistant captain Justin Courtnall about preparation for the Atlantic Hockey team that the Terriers last played three seasons ago. The DFP also reported that injured forward Yasin Cissé and defenseman Ryan Ruikka won’t return to the lineup this week. Heading into BU’s fourth game, junior assistant captain Alex Chiasson and sophomore Sahir Gill (photo) are tied for the team scoring lead with four points apiece. What bodes particularly well for the Terriers is that—as Coach Jack Parker pointed out on Inside Terrier Hockey—senior Corey Trivino and junior Wade Megan have been his best performing forwards to date. The Terrier’s schedule of TV games continues to grow. BU’s game at Notre Dame on New Year’s Eve will air leave on Versus, soon to be rebranded as NBC Sports Network. Bostonia profiles Elliott Dribben, BU’s fan for all seasons and all Terrier sports for more than 40 years. 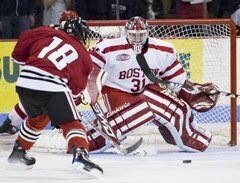 The Boston Hockey Blog takes note of the 16th anniversary of Travis Roy’s tragic accident in his first college game, as well as his continuing impact on BU’s hockey program. ►With no BU hockey scheduled tonight, you can take a look at the Vermont Catamounts who will be at Agganis Arena on Nov. 18. The Cats’ game against Minnesota airs tonight at 7 p.m. ET on NESN and Fox Sports North. 2012 recruit Matt O’Connor won his fourth straight game, stopping 22 shots in Youngstown’s 4-3 OT win against Cedar Rapids. A pair of former BU All-Americans now playing in Europe, Freddy Meyer and John Curry, were named to the U.S. Men's Select Team that will compete at the Deutschland Cup from Nov. 11-13 in Munich, Germany. Meyer is playing for MODO in the Swedish Premier League, while Curry tends goal for the Hamburg in the DEL. The #4 ranked Terriers head to the North Country to play Clarkson and St. Lawrence. The weekend begins today at 3 p.m. against the Knights, who are 3-0-1, coming off a sweep of Syracuse. 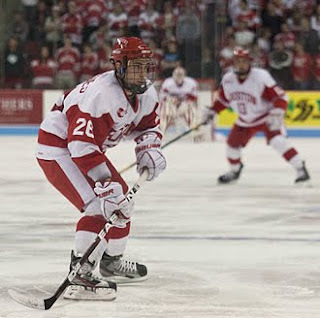 Episode 2 of Inside BU Hockey is now available on the BU Athletics Web site. Bernie Corbett’s guests are Head Coach Jack Parker, sophomore Matt Nieto, who has scored a goal in all three games this season and has points in his eight of his last nine games, and 1995 NCAA championship team member Ken Rausch. The interview with Rausch, a former UMass-Lowell assistant and current manager of Youth Hockey for USA Hockey, is a particularly enjoyable one as he recalls the circumstances that made him, an unrecruited walk-on, a Terrier, as well as his penchant for delivering in tournaments (video). International Scouting Services, reporting on prospects for the 2012 NHL draft, says 2012 recruit Robert Polesello's stock is rising. go undefeated. Polesello is a smaller, skilled offensive minded forward that possesses great tools. He is an exceptional skater, displaying a ton of speed and quickness that allows him to dart in and out of the open ice and create separation. His quickness is likely the best in this draft class and matches much of the best players in the world in that regard. Brian Strait, recalled from the AHL to Pittsburgh, was in the lineup for last night’s Pen’s win against the Wild, but suffered an upper-body injury during the second period. Former Terrier co-captain John McCarthy assisted on three goals in the Worcester Sharks’ home-opening 6-1 win against Albany. Note the Sharks’ lineup filled with former collegians, including Sean Sullivan. Freshman Kayla Tutino, who scored a hattrick in the 6-2 win over Union College, was named Hockey East Rookie of the Week. Captain Jenn Wakefield and goalie Braly Hiller earned spots on the leagues list of top performers for the week. ● Daily Free Press feature on Corey Trivino (photo credit, Brendan Mahoney) who has a power play goal, a shorthander and one at even strength in three games. 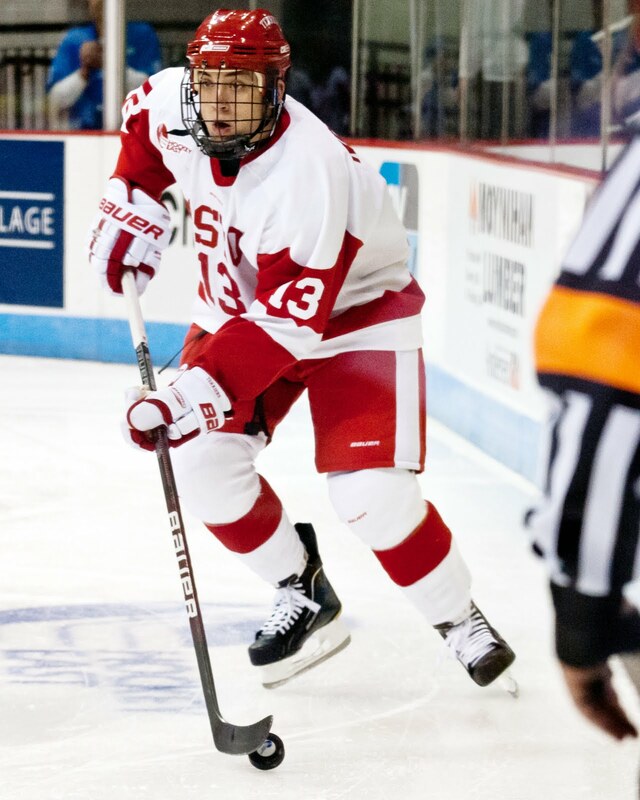 ● Trivino, Matt Nieto and Adam Clendening were named to Hockey East’s list of top performers. ► Hockey East now posts video highlights from games involving conference members on the Hockey East YouTube Channel, affording an opportunity to see other teams in action. That channel has been added to list of links in the blog sidebar for fast access. ► Blog contributor Candycanes99 has provided a photo gallery from Saturday's 4-3 win against Denver. ► Blog contributor Candycanes99 has provided a photo gallery from Saturday's 6-2 win against Union College. Two shorthanded goals and a power play marker in the first three minutes of the second period powered #7 BU past #3 Denver, 4-3, at Agganis Arena. Sophomore Matt Nieto, who earned first-star honors, and second-star Corey Trivino (photo) both scored early in the middle stanza while Garrett Noonan was serving a penalty. For each, it was the third goal of the season. Two minutes later, with the Terriers enjoying a man advantage, Wade Megan found net on a backhander, extending BU’s lead to 4-0. Alex Chiasson had opened the scoring midway through the first period, assisted by Cason Hohmann—his first career point. Despite BU’s continued strong play in the third, Denver clawed its way back. A wrap-around goal that just eluded Kieran Millan, a blueline shot that glanced off Millan’s pad, and an extra-attacker goal narrowed the margin to 4-3. BU nearly added an empty netter before time expired. Millan finished with 35 saves, and the win, the 63rd of his career, vaulted him past Sean Fields into first place for victories by BU goalie. The Terrier defense made an emphatic reversal from Friday night’s subpar effort. Sophomore Pat MacGregor was very effective, using his body and reach well. The former Avon Old Farms standout made a strong claim to stay in the lineup once Ryan Ruikka returns. ● Coach Jack Parker’s comments. 2012 recruit Matt O’Connor won his third game in a row for USHL Youngstown, stopping 22 shots in a 4-1 win against Des Moines. Nick Bonino assisted on four goals, including three by Kyle Palmieri, in Syracuse’s 6-2 win against Adirondack. David Van der Gulik, playing at Lake Erie for former Terrier associate head coach David Quinn, scored his first goal of the season in the Monsters' 5-3 loss to Toronto. Behind a hattrick by freshman Kayla Tutino, the #4-ranked Terriers pulled away from Union College for a 6-2 and raised their record to 4-1-0. Captain Jenn Wakefield added a pair, her 6th and7th of the season, and Kasey Boucher potted her first of the year. Braley Hiller stopped 27 shots to earn her first collegiate victory. Another freshman, Sarah Bayersdorfer, recorded her point. BU put a season-high 44 shots on goal. ● Coach Brian Durocher’s comments. The Terriers will try to rebound from last night's misadventure as they take on the third-ranked Denver tonight at Agganis Arena. The Pioneers doubled up BC last night, 4-2. Go Terriers.com has links to game notes, gametracker, the All-Access Webcast and the WZZN Radio Webcast. Defensive lapses put the Terriers in an early hole and then, following a BU comeback, Providence took the lead for good in third period, en route to a 5-3 win. The Friars took advantage of a turnover to get on the board at 2:48, doubled the lead 44 seconds later and scored again late in the opening period. BU cut into the lead a minute-and-a-half into the 2nd period when Matt Nieto roofed a wrister. Then, on a power play Corey Trivino pounced on the rebound of an Adam Clendening slapper. Terriers drew even early in final period when Garrett Noonan (photo) took a Sahir Gill pass in the right circle and found the top corner. But soon after that goal, BU took a penalty, which the Friars turned into the game-winning goal. They added another late in the period to blunt another BU comeback attempt. Kieran Millan stopped 25 of 30 shots. 2012 recruit Matt O’Connor produced another strong effort, stopping 30 shots in Youngstown’s 4-2 win against Des Moines. BCHL Vernon Vipers took their first defeat of the season following seven wins, lossing to Chilliwack, 4-1. 2012 recruit Marc Hetnik, Jr., assisted on the Vipers goal. Chris Bourque had a five-point night (2+3) in AHL Hershey's 7-5 win against Norfolk. #4 BU takes on Union College today at Walter Brown Arena in a 4 p.m. start. The matchup will have junior transfer Isabel Menard facing off against her twin sister Talia. Both tranferred from Syracuse. The #7/8 Terriers go on the road tonight for a Hockey East matchup against Providence College. The Friars, who will be playing their first game, have a new coach, Nate Leaman, who led Union College into the NCAA playoffs last season. 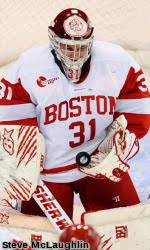 But there is a familiar face in goal for the home team, senior Alex Beaudry, who has proved to be a tough nut to crack for BU since he joined Providence midway through the 2008-09 season. The past five meetings between the teams have been low-scoring, one-goal games with BU winning four of them. Last season against Providence, sophomore Matt Nieto (photo) scored a goal and two assists while Adam Clendening scored the game-winner in one Terrier win and assisted on Joe Pereira’s game-winner in another. NESN will air the game beginning at 7 p.m.
Jack Kelley, who led BU to back-to-back national championships in 1971 and 1972 before moving on to coaching and management in the pro ranks, is keeping his competitive fires fueled through his longtime passion for harness racing. An All-East defenseman and Terrier MVP in 19952, he later coached BU for a decade racking up a 206-80-8 record and .720 winning percentage. Steve Stirling, an All-American and captain of the 1971 NCAA champs, has returned to his duties as assistant coach of the AHL Binghamton Senators following quadruple bypass surgery last Spring. Stirling was the New York Islanders’ head coach from 2003-2006. Former BU defenseman Brian Strait’s first goal of the season was the game-winner AHL Wilkes Barre/Scranton in a 5-1 thumping of Rochester. Former All-East blueliner Bryan Miller, second-team All-ECHL last season, was named alternate captain of the Alaska Aces who begin league play tonight. The #4-ranked Terriers' five-game homestand concludes tomorrow with a 4 p.m. matchup against Union College at Walter Brown Arena. BU owns a 7-0 all-time record against the Dutchwomen. BU Athletics today launched an new weekly Webcast, Inside BU Hockey, hosted by Bernie Corbett, longtime voice of Terrier Hockey . Episode 1 features interviews with Head Coach Jack Parker, captain Chris Connolly and 1987-88 co-captain Tom Ryan, who is the analyst on BU hockey broadcasts. USCHO’s Dave Hendrickson talked with Hockey East Commissioner Joe Bertagna about the conference’s flexible scheduling helps its team’s to schedule games with some of the elite teams from other parts of the country. Notre Dame’s acceptance into Hockey East for 2013-14 has led to speculation over a potential 12th conference team. We’d heard rumors that RPI is interested. Now, the Worcester Telegram reports that several city officials are ready to get behind efforts to bring Holy Cross into the league. ● Hockey East weekend preview . 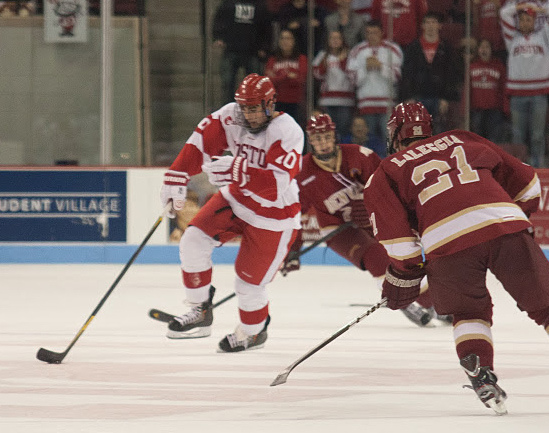 #7/8 Terriers play at Providence Friday and host #3 Denver at Agganis Arena on Saturday. What do three current Terriers have in common with Nyjer Morgan, who drove in the game-winning run in the Milwaukee Brewers’ NLDS win over Arizona? Answer—Morgan skated for the BCHL Vernon Vipers in 1996-97. More recently, Sahir Gill was a member of two RBC Cup winning Viper squads, while Ryan Santana and Garrett Noonan each won the Cup with the Vipers once. Kevin Shattenkirk, who topped all rookie defensemen in scoring last season with 9-34-43, scored his first goal of the season in St. Louis’ 5-2 win over Calgary. Long Island native Matt Gilroy returns to the Island tonight with Tampa Bay. Penalty-killing whiz Jay Pandolfo is back in the NHL with the Islanders. Sean Sullivan recorded his first goal of the season for AHL Worcester in the Sharks’ 4-1 win over Providence. Sullivan had a career-high 49 points last season. 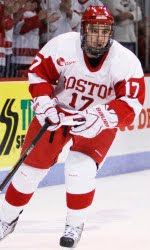 The game featured three other ex-Terriers: Shark winger John McCarthy and Bruins d-men Colby Cohen and David Warsofsky. Dan Spang, now in the Dallas Stars organization, scored his first goal of the year in AHLTexas’ 7-0 blanking of Oklahoma City. Senior Jenelle Kohanchuk, off to a strong start (4 goals in 4 games), is helping to pick up the scoring slack due to Marie-Philip Poulin’s injury. Terriers host Union College Saturday afternoon at Walter Brown Arena. Kieran Millan, with a 35-save performance against New Hampshire, was named Hockey East defensive player of the week while Chris Connolly and Alex Chiasson were named to the conference list of top performers. CHN’s Scott McLaughlin offers analysis of BU's 5-0 opening night win and an update on Yasin Cissé’s condition. USCHO: Terriers move up from 10th to eighth with three first-place votes. USA Today: BU drops from sixth to seventh; one first-place vote. 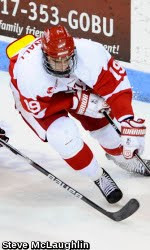 The 2011-12 BU Hockey Prospectus has been added to the sidebar links. We’ll post a link to the 2011-12 interactive media guide when it becomes available. This Friday's game at Providence will air regionally on NESN. We'll post a full schedule of televised games when it becomes available. Bleacher Report offers one man’s opinion of the top 10 NCAA college hockey championship teams, a list that includes the 2009 Terriers. What do three current Terriers have in common with Nyjer Morgan, who drove in the game-winning run in the Milwaukee Brewers’ NLDS win over Arizona? Look for the answer later this week. In a match-up of two top U18 teams in the Massachusetts Selects League, 2013 recruit Brendan Collier scored a hattrick and added an assist to lead the GBL Junior Bruins past the Cape Cod Whalers, 7-3. Collier, with a 7-7-14 line in four games, is the league’s top scorer. 2012 recruit Matt O’Connor was named USHL goaltender of the week following his 3-0 shutout of the Chicago Steel in which he stopped 22 shots. Senior captain Jenn Wakefield earned Hockey East co-player of the week honors for her four goals and three assists in the sweep of Niagara. Kathryn Miller, Isabel Menard, freshman Kayla Tutino were named to the list of top performers for the week. Senior goalie Kieran Millan stopped all 35 shots and five different Terriers scored goals as #6/10 BU whitewashed New Hampshire, 5-0, in the team’s season opener. Following a scoreless first period, junior Wade Megan, who had a pair of goals in last week’s exhibition, continued his hot hand, converting a Chris Connolly centering pass from in tight. Senior Corey Trivino doubled the lead, also off a Connolly feed. Early in the third sophomore Matt Nieto knocked a rebound out of the air into the Wildcat net. An empty netter by junior Alex Chiasson and a goal by senior Kevin Gilroy rounded out the scoring for the Terriers who put 37 shots on goal. Connolly, Chiasson and sophomores Charlie Coyle and Sahir Gill all had two-point nights. The victory was the 62nd of Millan’s career, tying Sean Fields for the top spot in the BU record book. It was the sixth career shutout for the netminder who was BU’s most valuable player last season. The win also tied Millan with John Curry for most Hockey East wins by a Terrier, 40. A crowd of 5,148 at Agganis Arena watched BU launch the 90th season in a program that began in 1918. ►The NHL began its season with 44 former Hockey East players, including nine ex-Terriers, on team rosters. 2012 recruit Robert Polesello appears intent on living up to the USHR report about him we posted this past Tuesday. Friday night, he scored the 3rd-period game-winner in USHL/ Indiana’s 5-3 win over the NTDP U17s, with 2013 recruit Robbie Baillargeon adding the insurance goal. Last night, Polesello scored again and added an assist in a 7-4 win, again against the U17s. The speedy forward from Bolton, Ontario, now has three goals in three regular season games on just seven shots. 2012 recruit Matt O’Connor registered his first shutout of the season, making 22 saves in USHL/Youngstown’s 3-0 victory over Chicago. 2012 recruit Mike Moran scored twice, including the game-winner midway through the third period, as BCHL/Victoria doubled up Surrey, 4-2. Moran, a Marshfield, Mass., native who was captain at The Taft School last season, earned first-star honors for the second time in six games this season. Eric Gryba scored his first goal of the season in AHL Binghamton's 3-2 loss to Toronto. #4-ranked Terriers completed a weekend sweep of Niagara with a 5-2 win. Senior Jennelle Kohanchuk’s second goal of the game broke a 2-2 tie in the second period and transfer Isabel Menard stretched the lead to 4-2 with a second left in the middle stanza. Senior captain Jenn Wakefield’s second goal of the night closed out the scoring in the third period. Alissa Fromkin stopped 29 of 31 shots for her first win of the season. Tonight the Terriers will open their regular season--the 90th in program history--with a Hockey East matchup at Agganis Arena vs. the #12 University of New Hampshire Wildcats. UNH was tabbed to finish 3rd in Hockey East in the pre-season coaches' poll, just behind BU. The Terriers won last season's series two games to one. Chris Connolly's second season of captaincy officially begins tonight. Kieran Millan is expected to be the starter in goal. With two goals in the final period, the Terriers were victorious by a 3-1 score over Niagara last night. Freshman forward Kayla Tutino notched her first collegiate goal, shorthanded, to put the game away late in the third after previous scores from seniors Jenn Wakefield and Jenelle Kohanchuk. Sophomore goaltender Kerrin Sperry was 18 for 19 in saves. The teams will face off again at 3 pm today. Former Terrier captain Dan Spang, now in the Dallas organization, begins the season with the AHL Texas Stars. David Van der Gulik and Zach Cohen will be skating for former BU Associate Head Coach David Quinn, in his third season with the AHL Lake Erie Monsters. #4-ranked Terriers begin a two-game series with Niagara at Walter Brown Arena tonight. Notre Dame was officially accepted into Hockey East at yesterday’s press conference in South Bend, with the Irish beginning conference play in 2013-2014. By the time that happens, BU will have played Notre Dame three seasons in a row. The Irish visited Agganis Arena in October 2009 and came away with a 3-0 win. A year ago, the Terriers edged the Irish, 5-4, in the Icebreaker Tournament. This season, the teams will meet on New Year’s Eve at Notre Dame’s new Charles “Lefty” Smith, Jr. Rink. Prior to the recent games, the two schools had only met twice previously, both games won by the Terriers by a 7-3 score: Dec. 1971 at the Boston Arena Christmas Tournament and Dec. 1995 in the Badger Showdown. One more BU connection with the conference’s new Western outpost: Jacques Joubert, captain of the 1995 national championship team, is a South Bend native. ● College Hockey News: analysis, what’s next? During the press conference, it was revealed that Versus (soon to be rebranded as NBC Sports Network) will air some Hockey East games. Earlier this month we posted the schedule of eight conference games set for CBS. NESN also will be in the picture, airing a number of conference games. We’ll post a full schedule of BU’s television schedule when it becomes available. Former Terrier forwards Chris Higgins and Joe Pereira, who had looked into playing in Sweden’s Hockey Allsvenskan League this season, have been signed by the ECHL South Carolina Stingrays. Peter MacArthur and Ryan Weston are on the pre-season roster of the ECHL Las Vegas Wranglers. Despite a strong showing in Pittsburgh Penguins training camp, Brian Strait will begin his season in Wilkes Barre/Scranton. Prior to his assignment to the AHL, Strait talked to the Times Leader about his three games played in the NHL last season and his hopes to stay at the top level. Hockey East named Senior Jenn Wakefield Player of the Week for her three-point (2g, 1 a) effort against North Dakota, while sophomore goalie Kerrin Sperry took Defensive Player of the Week honors, stopping more than 30 shots in both games.